Whether you are a buyer, seller, lender, broker, agent, or property owner of real estate, disputes frequently arise. Rachel has been a real estate lawyer for over ten years and can help. Having problems with your bank and your home loan? Wrongfully facing foreclosure or already foreclosed? Ms. Khirallah fights for homeowners facing the unjust or unlawful foreclosure of their homes. Rachel Khirallah’s prior experience in representing lenders and servicers gives her an advantageous perspective in successfully representing homeowners. Experiencing Issues Related to Faulty Construction? Purchasing a home is the single largest investment most will make. When your home is not what you thought it was, Ms. Khirallah holds those who knew or should have known about the problems accountable. She regularly represents homeowners who find out later that their home has improper design defects, foundation damages, unexpected flooding and improper drainage, termites, and any other defect that was not disclosed to the homeowner. Khirallah PLLC represents individuals and businesses in all disputes related to real estate. 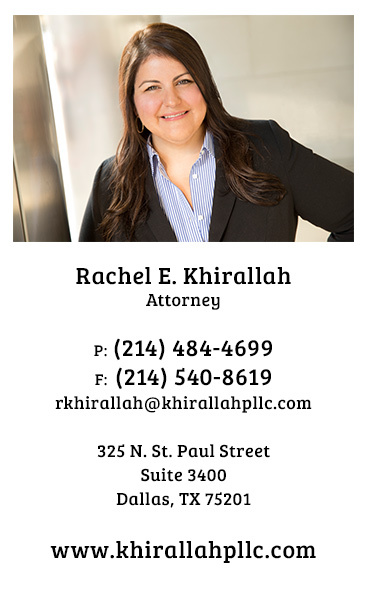 Contact Khirallah PLLC today to review your case for free to see if we can help. All disputes have deadlines that if missed can bar your recovery. It is extremely important to seek legal advice right away. Please contact us today to see if we can be of assistance.